These Pop-Tarts have the least amount of flavor of any Pop-Tart I've ever tried. In fact, they have less flavor than any brand of toaster pastry I've ever tried. Vanilla Milkshake Pop-Tarts are surprisingly short on vanilla. The most prominent taste is that of the dough. It's very sweet... but when sweetness has nothing to enhance or mingle with, what's the point? This Pop-Tart is dull. If you like the frosting on Pop-Tarts and have ever wished you could get the same sugary frosting on the inside, you might want to try them. Everyone one else should stay away from this one. Each toaster pastry has 200 calories, 6 grams of fat (2 grams saturated; 0 grams Trans), 35 grams of Carbs, less than 1 gram of dietary fiber, 2 grams of protein and 16 grams of sugar. 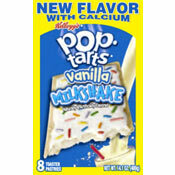 What do you think of Vanilla Milkshake Pop-Tarts? I like the taste of these, but I think they're just extra sugary. I wouldn't mind just dipping them in milk. I was disappointed to learn Kellogg's is discontinuing my FAVORITE PopTart... VANILLA MILKSHAKE. Some people drink coffee every morning for breakfast but I eat the Vanilla Milkshake PopTart. And now I don't know what I will eat because I don't care for any of the other ones. Please join me in letting Kellogg's hear the voices of those who are unhappy with their decision to discontinue the Vanilla Milkshake PopTart. They also discontinued the chocolate with white filling too. It Is So DELICIOUS!!!!!! I Do not like The Crust Though. MADDDD Good. They are the only ones I eat. These are my favorite pop tarts. Where did these go? They are the best pop-tarts ever! 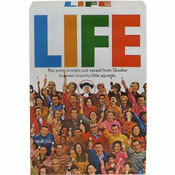 Please, tell my local grocer to put them back on the shelves! I regret to say I've had sort of an addiction to pop tarts for a while. It started with the hot fudge sundae flavor but it's been milkshake for a long time now. I think they taste just like sugar cookies! My favorite! I'm eating some right now, after my brother just complained how disgusting they were. I personally think they're OK but nothing more. they have an interesting , and appealing taste, but I see how eating two of them could get boring. One is ok.
Blah! Spam is better than this! I had some of these last night, and within 20 minutes they completely cleaned out my insides. Holy cow, it was a colon blow. I will never eat these again... unless I get backed up. Loved these actually. I like the cake batter flavor of the vanilla, reminded me of desserts toasted with powdered sugar. Probably my favorite flavor in a long time. These are easily the least appealing pop-tarts ever. Even my kids didn't care for them. The dough is the same, but the filling is a flavorless goo. It's like eating dough-flavored frosting. I actually thought these were really good. Unlike some other people have noted, I thought they tasted just like a vanilla version of the Hot Fudge Sundae Pop-Tarts, which are my favorite. Vanilla Milkshake Pop-Tarts might be a close second though! Had these recently, and I agree, they're pretty bland/boring. Once it was warm it seemed as though the filling melted and soaked into the dough, it's like it disappeared. These are actually my favorite next to smore! I do sympathize with the taste of dough (actually to me, cake batter or cupcake batter) but i actually prefer it over the hot fudge sundae. i like the flavour itself, though very light. I don't agree that it has the least amount of flavour, but i can understand how you can say that especially compared to other flavours, like cherry or apple. I'm eating one right now and it's delicious. These are actually very good frozen. The filling's taste comes out a little better. It's funny, as I liked the vanilla half of the splitz, and these seem different. I recently bought these because I am a big fan of the Hot Fudge Sundae pop-tarts. I thought they would be very similar. However, I was wrong. All I could taste really was the dough. Interesting idea, horrible execution.